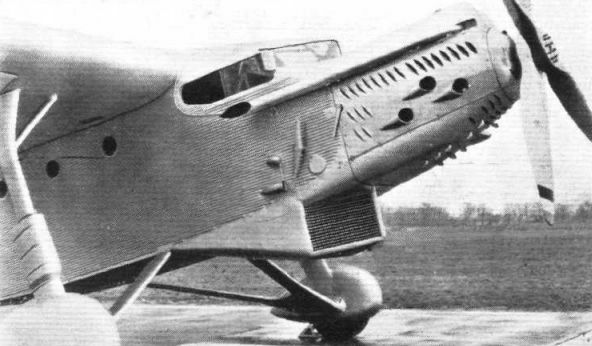 GENERALLY similar to previous Ford monoplanes, and, in fact, having the same wing, fuselage, and tail structure as the type 5-AT, the Ford 8-A freight carrier is aerodynamically ДальшеMore>>> superior in that it has a lower minimum drag as a result of the removal of the outboard engines. The consequence is that, when carrying even a quite heavy load of freight, the machine cruises at the very useful speed of 110 m.p.h., at which cruising speed it has a range (in still air) of 500 miles, and carries a pay load of 3,500 lb., or 5.38 lb./h.p. The fact that the type 8-A has wing, fuselage, and tail identical with those of the three-engined type 5-AT enables operating companies who already own the earlier model to change over, should freight traffic at any time become greater than passenger traffic, to the new freight carrier with relatively small trouble and expense. The space in the fuselage available for freight is large, 18 ft. 9 in. long, 6 ft. high, and with an average width of 4 ft., giving a total freight "hold" volume of 529 cu. ft. Thus, even quite bulky freight can be carried. Apart from its use as a carrier of general cargo, the Ford 8-A can, of course, have its fuselage space adapted for the carrying of any special cargo. 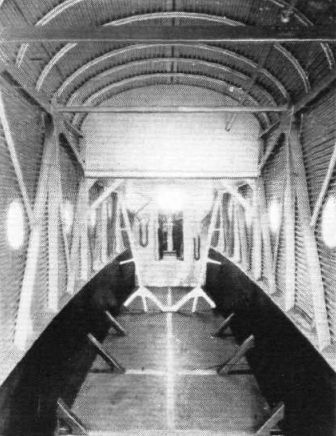 The photograph of the cabin shows how relatively free of obstruction the space is. As standard power unit, the 650-h.p. Hispano-Suiza engine has been chosen. This has been found to give excellent results, but, should any operating concern desire to fit any other power plant of approximately the same power, there is no difficulty in doing so. The accompanying photographs show the Ford 8-A to be a very "clean" machine, the undercarriage strut attachments to the wing being faired and the wheels being provided with "spats." This appearance of clean lines is substantiated when one comes to examine the performance in relation to weight, power, and wing area. The value of the Everling "High-speed Figure," which represents propeller efficiency divided by drag coefficient, is no less than 21.53, which is above the average value. If a propeller efficiency of 75 per cent, at maximum speed is assumed, the minimum drag coefficient of the 8-A in British "absolute" units becomes 0.0174 for the complete machine. If the Ford 8-A is efficient aerodynamically, it is equally so regarded as a piece of structural engineering. The ratio of gross weight to tare weight is 1.803, which means that the machine carries as disposable load 80.3 per cent, of its tare weight, a figure well above the average value. The disposable load can, of course, be apportioned in any desired ratio, but the standard machine carries, as already mentioned, fuel for a range of 500 miles, which leaves a pay load of 3,500 lb. At the normal rated engine power this represents 5.38 lb./h.p. THE NEW FORD FREIGHTER: The type 8-A is a single-engined version of earlier Ford types. The engine is a 650 h.p. Hispano-Suiza, with which the tare weight is 6,100 lb. and the permissible gross weight 11,000 lb. Out of the disposable load of 4,900 lb., the pay load may be 3,500 lb., when the range is 500 miles.